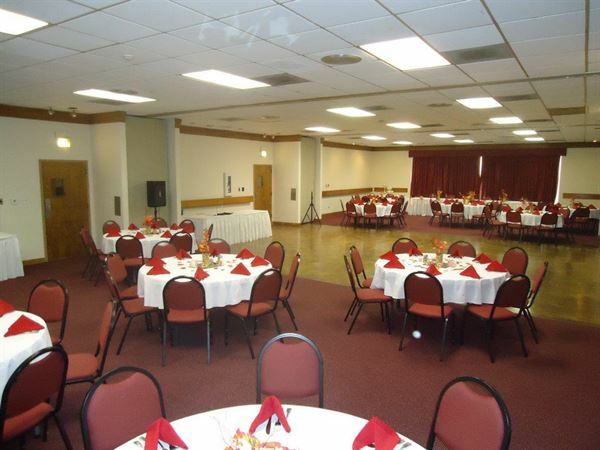 Our large banquet room can be divided into three smaller rooms, accommodating smaller events. This is the perfect place to host your business meetings, class reunions, baby showers, family reunions, and many other events. The banquet room and lobby can accommodate up to 250 people comfortably with a variety of setup options. The Magnuson Grand Hotel takes care of all of the setup, teardown, and cleanup, leaving you to enjoy your special day. This is one section of our main banquet room which is all solid wood flooring. Space is utilized for small meetings up to 40 guests. The State House Inn was the most stylish hotel in Springfield when it was built. We're proud to retain this title today and are excited to present to you the newly remodeled State House Inn. State House Inn is located in the heart of downtown Springfield, and puts you six blocks away from the Abraham Lincoln Presidential Library and Museum and the Old State Capitol. If you're here on business, St. Johns Hospital, Prairie Capital Convention Center and Abraham Lincoln Capital Airport are a few miles from the hotel. This location offers 5,400sq ft of ballroom and meeting space, 125 newly renovated rooms and a number of complimentary amenities including free daily hot breakfast, on-site parking, daily paper, WiFi, and a fitness center. Built in 1917, 210 Broadway has been reincarnated into a beautiful restaurant and bar, blending the old factory frame with timeless interior design. Arlington’s Upstairs offers a unique and beautiful setting for wedding receptions, rehearsal dinners, showers, and other events. Arlington's Upstairs room offers a full bar, stage, elevator access, free AV and sound equipment, a photo booth, private bathrooms, and in house catering. This unique room holds up to 140 people seated and 275 standing room only.....however, we now offer our whole building for events and that boosts are seated capacity to 200 and standing room to 350. This space is beautiful and one of a kind.